The automated system for metrological data processing, ASOMI, is a powerful EAM tool for enterprises exploiting numerous gauges, from a dozen to several hundreds of devices. The system is designed for automating the workflow of enterprise metrology departments dealing with measurement accounting. The system helps to manage every stage of the metrology cycle, along with planing and controling all the metrology procedures. 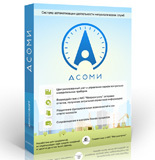 ASOMI, the automated system version 1.4, was audited for compatibility with the automatic information system Metrcontrol, the global unified system of gathering and processing metrology equipment in Russian Federation, nation-wide. The audit proved the metrology EAM system to fulfil the official requirements on compatibility of metrology service firmware (by a legal entity) with the automatic information system for accounting the inspection data by the Federal Agency of Technicla Regulation and Metrology. The featured metrology EAM provides access to sending and receiving data by Metrcontrol. Officially approved compatibility with massive automatic metrology information systems. Plain intuitive interface: you learn to efficiently work in the system soon after you first see it. Ease of inputting, retrieving, and displaying the metrology data. Web interface: the automated system is available as a web app. No need to install any software to get advantage of the full set of automatic metrology calculation, calibration, reporting, etc. You just save your time and money. Handy compatibility with other software you use in the enterprise. Flexibility in getting adapted to new requirements (e.g. to a new look of official reporting forms). Unified view of the regulatory data. Open software architecture (welcome to request a customization!). Reliability proved with successful implementation in numerous enterprises. ASOMI, the acclaimed EAM for metrology, is a handy tool to track the up-to-date status, maintenance, and usage of measuring means, along with other metrology equipment in an enterprise. Bringing automation to all the departments in an enterprise working with metrology provides the advantage of timely informing the staff and the enterprise decision-makers on the way the equipment operates. Once installed, the ASOMI metrology management system makes the work flow of all involved departments more transparent as executives get access to all the data required for making prompt strategical decisions and evaluating the efficiency of the entire metrology department operation. Centralized database and common storage of the metrology data provides instant access to all regulatory, technical, and legal documents for enterprise staff, executives, and external audit organizations.